Cherry season means Christmas is nearly here! If you could pick any salad ingredient that reminded you of Christmas, what would it be? For me, it’s cherries! In Australia, the trees are laden with this fresh, vibrantly red and succulently sweet stone fruit. Manjimup is the largest cherry-producing region in Western Australia and each year the local community holds the famous Cherry Harmony Festival. Taste the most delicious apple and cherry tart and see how far you can spit a cherry pip. Go on… it’s harder than you think! 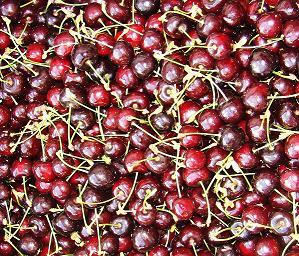 All the cherries are supplied by local growers including Harvey Giblett. Down the road, orchardist Louis Vellios, spends many hard working hours each year to make thousands of pine boxes for his cherries as gifts for the festive season. While at the orchard, he gave me a few tips on picking cherries straight from the tree. To find out how to make the famous cherry and apple tarts, go to my recipes page. Remember to make the most of your seasonal ingredients this Christmas!